Firstly, we would like to congratulate Andy Carter (and all his go talk team)on his 2nd European Championship, wow what a final it was too! At least we can now claim the Gold RV logo’s have won a Championship! 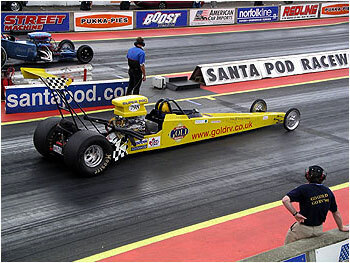 Unfortunately Gold RV Racing only enjoyed moderate success, qualifying with a mid table 11th and then knocked out in the second round by Paul and his Malkey.com Ford Dragster, (sorry Gary, beaten by a Ford) & well done Paul. Whilst I have improved my reaction times it was lost on the line by yours truly falling asleep with only a .2 reaction time instead of the .005 I managed during qualifying, thanks to some tips of an old pro (Terry Gibbs), now all I have to do is master it during eliminations. Sorry team, but it was a close run thing and we should still fair well in the overall standings, especially when considering it is our 1st year. We would also like to express our sincere thanks to Lee & Richard of J & W Auto services, for the quick head job (ooh err, you know what I mean) and for obtaining the required parts in time. We were very close to not making it to the final so 11th Qualifier and through to the second round was all a bonus really, after my now infamous ‘little tinkle’. A special thanks to all of the Go Gold Crew you were brilliant again (especially Roving Images for the excellent catering) I believe we fed & watered over 25 people on our now infamous Saturday night dinner !. One bonus of being knocked out early is we could all now enjoy ourselves & I can say we were all very well watered. Thanks to Sharky for the excellent photo of our car and sign, now proudly added to our ever growing gallery and photo’s ordered, also a wonderful shot from Fiona of us and Paul at the start line, the reflections of our car on the track look quite stunning, shame we lost. So we now focus on the National Finals and with a good showing, we could still end up in the top ten !